It's funny...I don't like to sew...never have. My mom, bless her heart, tried to teach me, but I just don't like it...it stresses me. So the funny part is that Caresse LOVES to sew, and of course, I'm the teacher. I don't like being the sewing teacher either! HOWEVER, as mothers, we all make sacrifices, so I help her when she FORCES me to. This morning we made this little dress for Joeliana. Yes, it's cute, but my stressed brain says "I'll pay someone else to do the sewing", my mother brain says "stick with teaching Caresse, and soon she can make all the clothes alone and I wont have to pay her". I don't like to sew either...but I want to learn how to do it properly, so maybe I'll enjoy it a bit more. Want to teach me too? Heheh, I can hear your blood pressure rising as I type! aww so cute. I don't like to sew either. I don't sew much either, but I have some kids that have taken a few homeschool quilting classes and they have LOVED it. We haven't tried dresses yet. Hmmm... 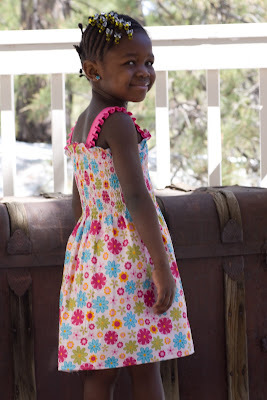 I think I'll have Hosanna learn to make dresses for the little girls. How cute!! Looks like y'all did a great job! I just found you via the Spruce Amba family site. I love the dress. I also love to sew...stop by and visit my blog. You may find something to make sewing...less stressful there. Beautiful job! I can relate on the sewing... hate it... My Mother loved it and taught my girls, it is one of their fondest memories of her.